Mark O’Dell runs his finger over the side louvers in the 1969 Corvette’s bodywork, feeling the fiberglass surface for the tiniest flaw. He wants this car to look right. It’s his. “But I also want it to be something I can drive, something that isn’t so expensive that I’m afraid to take it out on the road,” O’Dell, 50, says. So he’s adding chrome to the engine and making tweaks to both the performance and appearance. “It’s my car, so I want it to be what I want, not what someone tells me is ‘right’ for it,” he says. That philosophy is a reflection of how he does business. 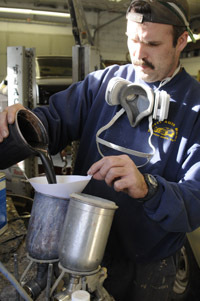 Working from a two-man specialty shop a few blocks off Forest Grove’s main street, O’Dell Auto Body & Paint is building a reputation for creating cars that look good both on the street and on the display stand. 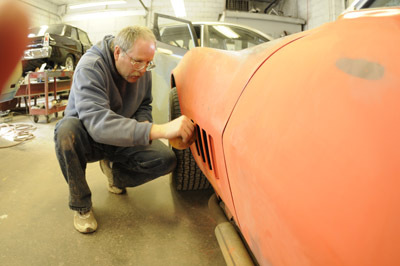 O’Dell began his career in the high-end restoration business, but gradually shifted from doing specialty work to the bread-and-butter collision jobs that keeps auto body shops open. He worked with a couple new car dealers in Hillsboro, until dealership mergers and sales left him without a place to operate. He can squeeze about five cars in the shop. Currently it holds O’Dell’s Corvette, a 1969 Plymouth Roadrunner undergoing restoration and a gleaming, black 1967 Chevy II fitted with a big-block V-8. The Chevy is Ed Johnston’s dream car. Johnston says he and O’Dell went over every bit of the car and agreed on what would be done and for how much, before any work was begun. O’Dell says the difference between one of his cruise-in cars and a concours-winning car is simply time and money. “They each take the same number of parts,” he says, “but the cost goes up every time we have to sand and prime and sand and prime. A concours judge can see the difference, but most enthusiasts can’t. And that’s who is paying the bill. “We can do a concours-winning car, but the folks we work with generally don’t want to spend that kind of money,” O’Dell says. Once in a while he turns a job down. On the Chevy II, Johnston and O’Dell worked together on ways to shave the bill and keep the project affordable. The bill on Johnston’s was under $7,000. Unlike some restoration shops where a car disappears behind a garage door and emerges two years later with a jaw-dropping bill, O’Dell insists each owner stays involved in the project. On occasion that owner involvement can backfire, says Jon Maslen, O’Dell’s only employee and the shop painter. “We painted the engine bay of the Road Runner the exact color the owner picked out,” Maslen explains, “but when he came by to check on progress, it wasn’t the color he wanted. He and I played for a long time mixing colors until we got what looked right to him. “But for us it was important that it be what he wants,” he says. In Johnston’s case, the color he wanted was a bit different than most. Apparently, it was an excellent choice. Shortly after picking up the car from O’Dell’s, Johnston entered the Chevy II in the prestigious Wapato Showdown, an annual gathering of Oregon cars that compete against one another in an open class. His finished second out of more than 400 entries.